I'll admit, I dont keep up with my chocolate reading very well but I did read, with great interest, Megan Giller's informative article on Slate.com last week, "Why Chocolate Experts Hate Mast Brothers." I read this one in particular because Ms. Giller is possibly the first journalist I am aware of to dive headfirst into the deep end of the chocolate pool (or tank, if you will -- a little chocolate humor for you) as it relates to the self-proclaimed "dangerous" company -- Mast Brothers. I am compelled to respond, because I'd like to address some of Rick Mast's remarks in the article. Here's the short history of the beginning of American craft chocolate. In 1997, Scharffen Berger was the first new bean to bar chocolate factory in the U.S. in over 50 years. They were acquired by Hershey in 2005. I started making chocolate in the summer of 2005, then incorporated Askinosie Chocolate in August of that year. Theo started in late 2006. Steve DeVries started selling first, then Taza, then Amano, then us, then Patric; all opened from early to mid-2007. Our five companies formed the Craft Chocolate Makers of America with Alan McClure as Chair. While I've never spoken with anyone at Mast, it was clear in 2008 when we started the group that they did not have any interest. We are no longer a formal organization but we talk frequently. This is fine, we didn't expect all craft chocolate makers to join nor did we judge their chocolate based on membership (there were no dues, for the record). The "expert" title was used in the Slate article in reference to Clay Gordon, Lauren Adler and Eagranie Yuh. Rick Mast said, "We have achieved incredible success without paying the self-proclaimed industry chocolate experts that you have cited a penny for their 'expertise.'" First, Clay Gordon, is an actual chocolate expert. I met him in 2005 on my first trip to Ecuador. Even then before most of the world couldn't tell craft chocolate from Hershey's, he already had a national reputation as a chocolate expert making a living from people willing to pay for his knowledge and experience. I paid him to accompany me on some of my very first cocoa bean origin trips in 2006 as an expert. At that time, I did not have the confidence to know what I was looking at but I knew enough to recognize that I needed to consult with someone of superior knowledge in order to produce a superior product before I became more experienced myself. I knew that he could help me buy the best beans possible and he did. Now, with over 20 origin trips under my belt on four continents I have more confidence in my cocoa bean sourcing/buying skills than my first trip almost 10 years ago. As far as I know not a single one of our retail partners (wholesale customers) around the world have sought Clay's opinion as to whether or not they should bring our chocolate into their shop. The fact remains, however, that there are not very many people in the world who possess Clay's knowledge of chocolate. This leads to Lauren Adler. She is the owner of Chocolopolis in Seattle and they carry our chocolate. We both started about the same time. There is no panel of judges making these buying decisions because Lauren, herself, is the judge. Lauren has been selecting the chocolate carried in her shop since the beginning, relying on her own palate and that of her staff (and now her customers). The same way that every other of the 700 stores that we sell to. I am not aware of one single shop carrying our chocolate from New York, to San Francisco, to Stockholm to Tokyo who has made the buying decision of what to carry in their store by consulting a "chocolate expert" on what is good and what is bad. They (the buyers) taste it and then educate themselves about the company producing it. Lauren is also an expert, but in a different way than Clay Gordon. As an owner of one of the most popular chocolate shops in the U.S. she has tasted pretty much every chocolate out there and has to make good business decisions about what brands to carry and what not to carry every day. I have never paid her a penny, nor any of our other retail partners. She does not carry everything we make and I am certain that she does not love everything we make. Regardless, I trust her and we frequently seek her feedback. Eagranie Yuh is also an expert, but as a writer and judge. She is not "self proclaimed," rather she's developed her reputation as someone who knows about chocolate from years of writing about it. She has authored many articles about chocolate in the last six years and most recently Chronicle published her book -- The Chocolate Tasting Kit. There are food competitions all over the world and somebody has to be the judge and chocolate is no different. We have never paid Eagranie for any "expert" services. Like Lauren, she does not like everything we make and is not afraid to say it. And we appreciate her opinion and listen to it, just like the others, especially our customers. Some of the people interviewed in the Slate article did not like the Mast chocolate and they clearly articulated their reasons. Lauren Adler is right when she said that we don't have a good frame of reference yet with regard to standards like the wine industry. While it's true that the wine industry, and coffee for that matter, have more mature tasting standards, chocolate is on its way. Some in our industry -- such as Colin Gasko at Rogue Chocolate -- are trying to establish common standards for tasting and quality. There are very basic defects, for example, that the experts in the article noted about the Mast chocolate that any chocolate expert ("self-proclaimed" or not) would find: moldy or stale aroma or flavor and chalky texture. I am not suggesting that Mast chocolate tastes this way because to be fair, even though I'm tasting chocolate all of the time, it's been a few years since I've tasted one of their bars. My point though is that while chocolate tasting standards are not as mature and codified as wine, it is possible for experts to have some agreement on defects which appears to be the case here. Does that mean that people should not journey "by the thousands" per week to the factory in Brooklyn and buy Mast chocolate? Of course not. I am thankful that so many visit their factory to learn about the bean to bar movement because it's good for the entire craft chocolate industry as more people become aware of another strata of chocolate possibilities in addition to Mast Brothers. Mast is a gateway chocolate. Those who visit their factory and love the experience will certainly seek out and experiment with other brands. I really doubt that any specialty shop in the country would decide against carrying Mast chocolate because they are, as brother Rick pointed out, "a dangerous company because we are outsiders to the chocolate industry never leaning on industry norms." That's like saying a wine shop would not carry the agreed-upon best Burgundy because the winemaker is a rebel or outsider. In fact, the suggestion is ridiculous. The real reason is that profitability is paramount for any business, especially small specialty food and wine shops. And -- don't think for a minute that any store owner in their right mind would refuse to carry a profitable line just because they don't care for the personality of the maker. Confession: I actually think their beards are kind of cool and if my hair wasn't pretty much all white (too many days in the courtroom) and if I was maybe 15 years younger, I would try to grow one like theirs. And honestly, there are times I dream about having a line out of our front door with "thousands of chocolate lovers mak[ing] the journey to visit our factory every week" like Rick Mast claims about his factory in Brooklyn. Our factory is in Springfield, Mo., in a part of our community that is undergoing revitalization, and populated by a variety of important social services and homeless shelters for those in need in our city. In eight years, I have never seen thousands of people here in one week, maybe not even in one year. This is why working with our retail partners across the globe -- and thus making the highest quality and best-tasting chocolate possible -- is paramount for us; because these stores and their fans all over the world are our bread and butter. February's Vanity Fair quotes one of the Mast brothers as saying "I can affirm that we make the best chocolate in the world." When I read that I thought, "well that's pretty bold and actually not true." In case you're wondering -- no, I don't think Askinosie Chocolate makes the best in the world and that mantle has never ever been my goal. I have always wanted to make "some" of the best chocolate in the world. I can say that we try to make "the best chocolate in the world" but I will never "affirm" that we do publically or even in my head. We have a saying here: "it's not about the chocolate, it's about the chocolate." We mean that we have a laser focus every single day on making the best chocolate we can with the best beans possible. We know that if we fall short of trying to make the best, then we will not be able to do the other things that are important to us: opening our hearts as wide as we can to learn and respond to the needs of each other, our neighborhood, our community and the communities where we source cocoa beans. There is often tension in this tug-of-war but we not only expect it, we encourage it. In fact, this tension and ultimate balance helps us make better tasting chocolate. Unlike Mast, we are not a "dangerous company" but like the Mast Brothers we have also achieved "incredible success," and I can tell you the day it happened. 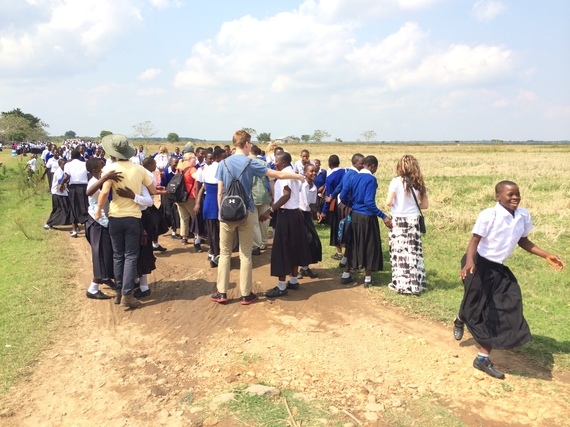 We take local high school students to Tanzania to meet farmers and experience life changing travel in a very competitive program we started called Chocolate University. One of our applicants wrote in her essay that she lived in the homeless shelter a block from our factory as a young girl and that she would walk to our factory and that we (our employees) treated her as a special person and that we gave her and her little brother chocolate samples. When I read that I realized that we treated her with hospitality and that she liked coming to our place and that as she grew older and achieved against the odds, she was inspired to apply to our program. We selected her and she went with us to Tanzania last summer. I may die tomorrow and if I do, then I will know that we are a successful company beyond all measure.